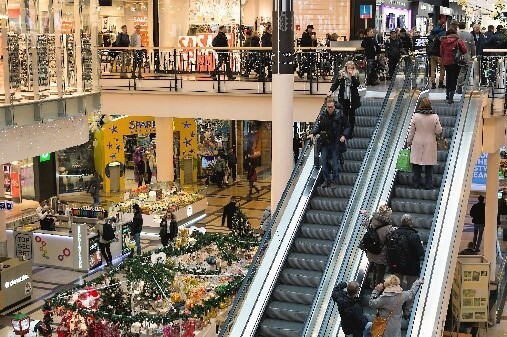 Some experts estimate that there are 12,000 to 15,000 escalator accidents annually in the United States. According to a report by Safety Research Strategies, Inc., while there are substantially fewer escalators than elevators, escalator injuries occur 15 times more frequently on an escalator as compared to elevators. While accidents on escalators are more prevalent than one might think, deaths are infrequent. However, more than 10,000 injuries get reported annually in the United States. Most are slip and fall accidents, but 20% of escalator deaths and accidents are the result of entrapment. Entrapment occurs when either a body part or article of clothing becomes wedged between moving parts. The holidays are quickly approaching. This means more traveling and more shopping. When was the last time you went to a mall or an airport and tried to find a stairway or elevator to go up and down? They are often inconspicuous. It leaves you with only one option, using an escalator. Whether airports, hotels, or malls…escalators are everywhere. Most of us give little to no thought of riding an escalator. They are convenient and often appear to be the only option to travel up and down with available elevators and stairways not visible or well-marked. Worse yet, we often are carrying large amounts of luggage, babies, strollers, shopping bags, or any number of other things. We assume they are safe. However, they are not as reliable as one may think. Many escalator accidents are the result of our own negligence or misuse. For example, inappropriate footwear, jumping the rails, intoxication, and riding on the handrails are examples of our own misuse. However, many design flaws and mechanical failures also contribute to many of these accidents. Industry experts advocate for more safe designs and enhanced industry oversight. Unfortunately, escalators do not face the same regulatory conditions in the as other mechanical equipment such as automobiles. Moreover, manufactured under voluntary guidelines, they typically have a long life, and many are old. We place a high degree of trust that they function correctly. Woefully, this is not always the case. The U.S. Consumer Product Safety Commission (U.S. CPSC) was petitioned on numerous occasions to develop mandatory standards. To date, they have not. Many industry experts and design engineers agree that escalator safety can improve. The U.S. CPSC offers the following tips to prevent escalator accidents. Make sure shoes to tie your shoes before getting on an escalator. do not use the escalator when you are bogged down by luggage or shopping bags. Report the accident to the company responsible for the escalator. Take the names and addresses of any witnesses. Keep receipts for any injury-related expenses. Contact an attorney to represent your interests. If you or someone you know has had an escalator-related accident, feel free to contact one of the experienced personal injury attorneys at Tramontozzi Law Offices. We can be reached at our office at (781) 665-0099 and offer a free consultation.